It will soon be Mothering Sunday and amongst the Mum, Mummy, Mom, Mother cards you might spot a few which are aimed at those who might not have even ever given birth but "mother" their friends and family members in the nicest sense of the word. I am blessed. I have a mother and I am a mother, many times over! But also I have people in my life who care for me and my children and without whom I would have found life very difficult at times. I know I am not alone in this so thought it might be nice for remind people not to forget those who mother them when it comes to Mothering Sunday on March 15th. Anyway. It's common knowledge that I like to involve food in pretty much every celebration. Birthdays, weddings, anniversaries and indeed Mothers Day would not feel right to me if not based around a meal of some sort. I particularly enjoy eating out. Not really a surprise especially when you bear in mind that my lovely husband (although pretty much perfect in most other ways) cannot cook. I mean, really can't cook. Tea and toast. That's it. So where to go for Mother's Day? Well one food I'm not great at cooking is steak so if we go out I will often order it (with chips obviously!) And one of my favourite places to eat steak is TGI Friday's where they offer their inimitable and irresistible (IMHO) Jack Daniel's sweet 'n smoky glaze as an option with many dishes, including a range of steaks. Much as I love my darling children sometimes a mother needs time away from them so last week I went with my husband and some close friends to TGI Friday's Milton Keynes Stadium restaurant to scope it out for you in time for Mother's Day. As soon as we walked through the door we noticed the buzz. That rare thing where there's a great atmosphere but you can still hear yourself talking at normal levels. Staff were friendly and welcoming - after more than 25 years of eating at TGIF's this was not news to me but it's nice to see it's still a priority at this particular chain. We took advantage of their special offer - from Monday to Friday you can eat two courses for £10.99 or £15.99 (two menus to choose from, selected restaurants only, check availability at your local restaurant online) which can offer significant savings compared to the main menu. There was lots too choose from and I really enjoyed my Cajun shrimp followed by steak (with Jack Daniel's sauce of course!) My husband chose the same whilst my friend's husband went for chicken wings with a bleu cheese dip followed by a rack of BBQ ribs which almost made me wish I'd ordered them instead of steak. He said they were very tasty and meaty! My veggie friend chose mushroom topped potato skins which she enjoyed, then the veggie fajita which I have to say was the disappointment of the evening. The mix of baby corn, onions, tomatoes, green beans, and garlic mixed peppers looked lovely but was a bit soggy and, she said, tasted very bland and like it had come straight from the freezer. It was meant to be sizzling but we think maybe it needed a bit longer or a hotter skillet plus maybe a bowl of grated cheese, or more seasoning. Our charming waiter offered us the dessert menus and despite feeling stuffed after generous TGIF portions we decided it was only fair to try a pud or two to properly review the restaurant so shared a Rocky Road sundae and the apple waffle crunch. Yum! Although we enjoyed our adults only evening I would say TGI Friday's is also a great venue for an outing for all ages, or a mixed group. We noticed the children's menu offers quite a few choices for smaller and larger appetites although the prices (£3.49 and £4.99) do not include a drink or dessert and the kid's menu is only available to children "up to" the age of 10 years. However if you have under-ten's the options are sure to suit even the fussiest child with pizzas, ribs, wraps, pasta and burgers to choose from. 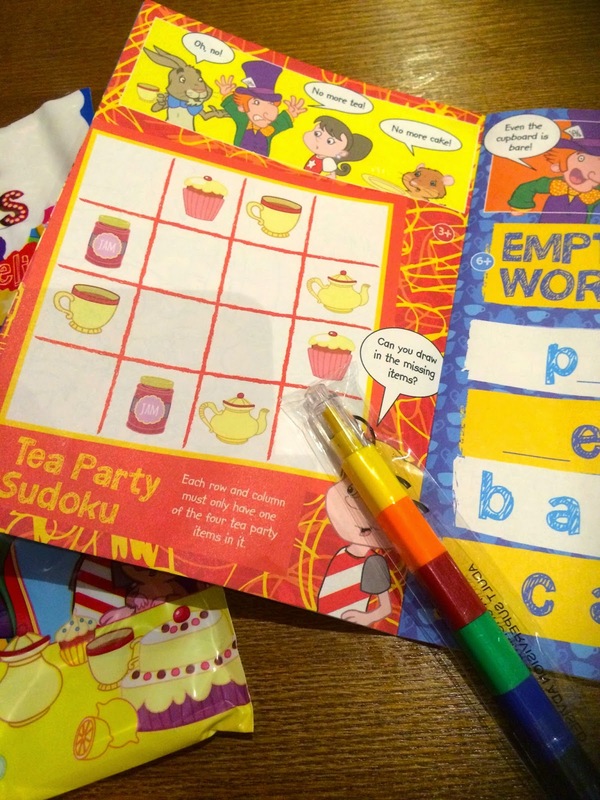 Each kid's meal comes with an pack which has crayons and a booklet containing lots of activities to keep them happy while they wait for their food . Teens seem to love the place too- while we were there staff sang their version of a Happy Birthday song to two separate groups celebrating 18th birthday parties. Certainly it's a great place to go if (like me) you love cocktails! I was easily convinced to go for the larger Woo Woo which came in a goldfish bowl type glass! I expect it will be a popular choice for Mother's Day - I would advise booking online well in advance. If you fancy a last minute trip you can't use the online service but look online for your local restaurant and give them a call - I did this and was impressed by the friendly and helpful reception I got. Helpful staff who know their product and make suggestions without coming across as too pushy. A well laid out menu with a really good selection on their special offer menus. A great range of cocktails. The idea of theming the restaurants around local interests. The restaurant we visited is near Bletchley Park, the home of the Codebreakers and the Enigma Machine and the design was based on this with a canoe named Enigma and coding on the walls. TGI Friday's seems very geared up for people with allergies and online you can filter the menu excluding potential allergens or download a guide to every item on the menu showing allergy data. They still recommend you inform your waiter of any allergies when you arrive however so they can be extra careful to avoid any cross contamination in the kitchen. There were no "real" beers on offer, only lagers which disappointed my real ale loving hubby and his friend. But it is an American-style restaurant so can't really complain. The kid's menu is only available for under 10's which I think is quite a young cut-off age. I think they should up the age to 12 and introduce a teen menu for around £7 for 12-15's to suit children like mine who have quite small appetites. I did have trouble initially ringing to book but when I did get through the person on the phone was very apologetic and explained they had been coping with an unusually busy day with 200 guests in one Corporate party. Disclaimer: I was given £50 vouchers towards a meal at a TGI Friday's of my choice. Views and opinions remain my own. Further disclaimer - I did not drink both of these cocktails! Thankyou- It was a lovely evening andI do love cocktails!